Brushing twice daily and still have bad breath? 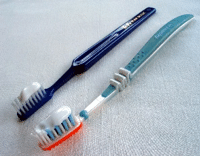 Home » Brushing twice daily and still have bad breath? Even if you brush twice a day and floss daily you may notice that you have bad breath or halitosis. This is perhaps because you maybe neglecting one of the most important parts of getting rid of bad breath: cleaning your tongue. Have you ever noticed a thin white coating or even a furry appearance to your tongue? This is a thin layer of mucous where bacteria and food particles reside- no wonder it is smelly right? Once you have spat out your residue toothpaste take the tongue cleaner side of your brush and run it under the water. Then gently brush it over the surface on the tongue starting from the back and pulling in through to the front. You may notice the white mucus coming off so rinse your cleaner as often as needed. Continue this until all of the mucous has been removed and your tongue looks nice and pink again. This is the most effective way for cleaning your tongue. 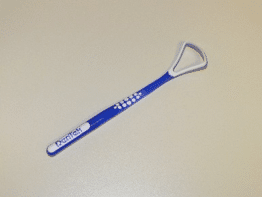 A tongue scraper is a flexible piece of plastic that removes the white layer of mucous on the tongue and they can purchased from many local pharmacies or large supermarkets. To use a tongue scraper place the scraper end at the back of your tongue and with a medium pressure slowly drag it towards the front of the tongue. Rinse and repeat as many times as you need until your tongue is nice and pink again. If your tongue gets sore or start to bleed then you are applying too much pressure and need to be a bit gentler. 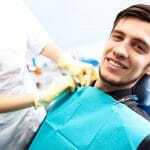 Call 1300 625 625 now to make an appointment to see our dedicated hygienist. She can assess why you have bad breath and talk to you about rinses and techniques to improve your breath.